Being a native Clevelander, I bleed brown, not red. Like many people in northeast Ohio and Browns Backers across the globe, I was raised on a steady diet of all things Brownie. So, what’s the big deal? Browns fan are a dime a dozen around here. 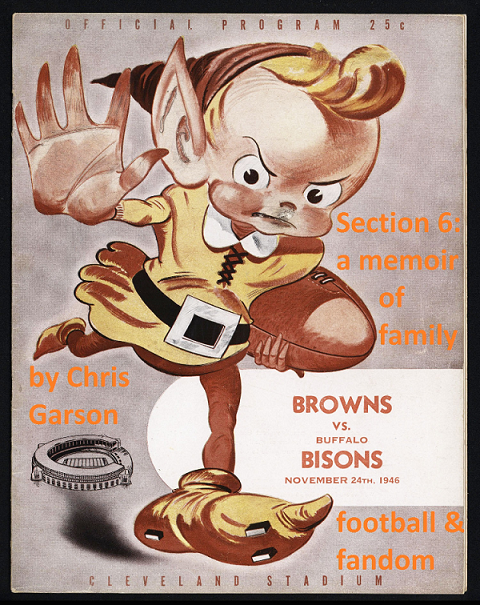 What may set me apart is how long my family’s romance with the Browns has lasted. My grandparents were among the 60,135 fans watching the Browns defeat the Miami Seahawks 44-0 in their inaugural game September 6, 1946. In the sixty-six years since, my family and I have been in the stands, in dens and in sports bars watching our team and loving it with all our heart and with all our soul, through good times and bad, in sickness and in health. It’s been a true marriage, with ups and downs, even surviving a lengthy separation in the 90’s. I just finished reading Section 6 and just wanted to say that I thoroughly enjoyed it. I am a Cleveland sports fan living near Pittsburgh so every time I have the chance to absorb anything Indians, Browns, or Cavs I absorb it with everthing I can muster. 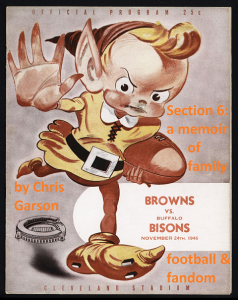 Your book was an excellent little critique of the Browns from a fans perspective. I can and do appreciate that. I have also read a book titled “On Being Brown” that is similar to yours. Living near Pittsburgh I have to go to great lengths to watch or listen to Browns games but when I succeed the people closest to me know to just let me do my thing for a few hours:) Thank you for giving me a unique viewpoint into our beloved Browns!! Go Browns!!! I think they can beat Carolina next week!!!! Thanx Nick. Maybe 2015 will be better for the Browns!